I bought Overwatch for my birthday. I have been really enjoying the game. It is a great FPS with lots of different types of characters to play and plays styles. 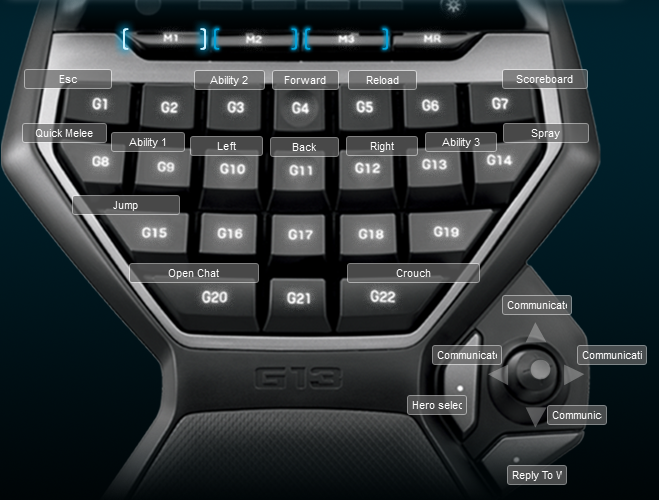 I made a Logitech G13 profile for it because I wasn’t happy with the default one. I don’t feel like the default profiles really take advantage of key placement on the G13. The profile works well and is similar to a typical FPS setup for me. The ability buttons are the non standard FPS buttons and they are in easy to reach places. I put the communication buttons on the joystick just to make it easier to quickly communicate without a mic.